In November, the latest report from The Growing Up in Ireland study from the Economic and Social Research Institute (ESRI) was launched. 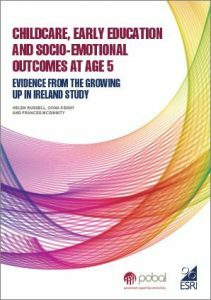 The study, Childcare, Early Education and Socio-Emotional Outcomes at Age 5, investigates the effects of childcare in early life on children’s socio-emotional development at age five using a large representative sample of children (circa 9,000) from the Growing Up in Ireland study. Parents were interviewed when children were nine months, 36 months and five years old; the teachers of the five-year-olds were also interviewed. The study found that while care of more than 30 hours per week was associated with a small negative affect, high quality early years care and education was found to offset the potential negative impacts of social disadvantage and family factors. However, a range of other factors are of far greater importance for five-year-olds’ emotional and social wellbeing than whether they were cared for in a creche or at home. These include social class, mental health of parents, number of parents, children’s own health and their gender. Care provided by relatives at age three was assessed by parents as giving rise to somewhat fewer socio-emotional difficulties and by teachers and parents to result in better social skills by age five. Children cared for by non-relatives, such as a childminder, at age three were rated by parents and teachers as having fewer emotional difficulties than children in full-time parental care. Those in centre-based care at age three were said by teachers to have slightly more socio-emotional difficulties at age five, compared to those who had been cared for by parents only. However, parents rated their five-year-olds who had been in centre-based care at age three to have fewer emotional and peer problems, but marginally higher conduct problems, compared to children in full-time parental care.